Several civilians were killed during the incident, which eventually became known as “The Battle of the Camels.” But now there may be some justice for those who allegedly had a role in one of the movement’s darkest moments. In the week leading up to that particular Wednesday morning, thousands of antigovernment protesters had managed to secure the symbolic heart of Cairo following the nationwide demonstrations that erupted on Jan. 25. But there was an uneasy atmosphere across the capital. Following the disappearance of the police from Egypt’s streets, groups of stick-wielding vigilante groups erected makeshift checkpoints outside their homes to ward off potential criminals. At times, Cairo felt like it was teetering on the cusp of chaos. In Tahrir Square, a carnival atmosphere prevailed as families sat around picnicking and protesters banged drums to a chorus of anti-Mubarak chants. Then the scene was interrupted in terrifying fashion. Seven months after the incident, 25 suspects are now standing trial, accused of ordering the attack. Among them are Fathi Sorour, the former speaker of the Egyptian Parliament; Safwat al-Sherif, the ex-leader of Mubarak’s old National Democratic Party (NDP); and two former MPs. Much like the hearings taking place in Egypt’s other landmark trial—that of its former leader and his sons—the case has not been without controversy. The judge has already banned live broadcasts, while earlier in the proceedings police prevented some journalists from entering the courtroom. Aside from the bitter memories involved, the trial could well serve up a tantalizing inside account of a crumbling autocratic regime’s desperate last spin of the wheel. On Tuesday the judge heard from Safwat Hegazy, a leading Islamic cleric who took part in the Tahrir Square protests. 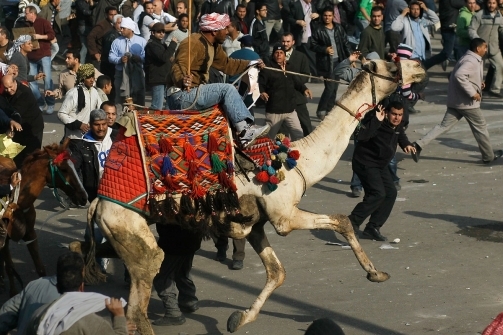 According to him, some of the camel riders and other attackers who were apprehended by demonstrators on Feb. 2 confessed they were hired NDP thugs. Egyptian newspaper reports have also claimed that the pre-trial investigation has unearthed evidence that Sherif, the ex-NDP leader, contacted other members of the party to recruit help in crushing the uprising. According to a camel tour guide near the pyramids, who knows some of the men who charged into Tahrir Square that day, there is no doubt that the regime was complicit in the attacks. “They were paid by rich businessmen and told to go to Tahrir Square,” 44-year-old Zaki Sultan told The Daily Beast. He named a parliamentarian who he claimed was involved in organizing the attacks, although that MP is not one of those currently being tried. Egyptians are experiencing a two-track revolution. Hosni Mubarak might be on trial, but a judge’s ruling that a number of key future hearings will take place behind closed doors has raised suspicions about the process. And while the parliamentary elections scheduled for November point to a revolution in good health, recent threats by the military that it will reinstate martial law would suggest otherwise. The court hearings surrounding the Battle of the Camels might lay to rest some ghosts, but there are plenty of demons lying in wait along the road ahead. Just over six months ago in December, a young Tunisian vegetable-seller called Mohamed Bouazizi returned to his family home, doused his body with petrol, and then set himself alight. He died a little over two weeks later. Tomorrow, the former president of Egypt is due to stand trial on charges of corruption and ordering the killing of his own citizens. If found guilty, he too could end up dead—swinging at the end of a hangman’s noose. For Hosni Mubarak, the former war hero and decades-old ruler of the Arab world’s most influential country, Wednesday’s court appearance will be an unprecedented fall from grace in a region not known for bringing many of its manifold autocrats to heel. For Mohamed Bouazizi, the humbling of Egypt’s aging general is one of the most extraordinary developments in his already-seismic legacy: the so-called Arab Spring. On Sunday, Egypt’s ruling military council announced that the trial would be held in a police academy on the outskirts of Cairo. A cage for the defendants—who are also expected to include Mubarak’s two sons, Gamal and Alaa, former Interior Minister Habib al-Adly, as well as six police officials—has already been prepared, while TV screens are due to be erected outside to broadcast proceedings to members of the public. Despite the setting, Egypt’s former president will nonetheless be tried like any other backstreet Cairo criminal. The only difference will be the tens of thousands of court documents and hundreds of witnesses, a solemn reminder of the estimated 840 deaths which resulted from Egypt’s uprising. Even so, and despite the worries of some protesters that Mubarak could still somehow thwart the wheels of justice, the military council has announced he is fit to be prosecuted and will be transferred to Cairo this week. It’s probably a wise move for the generals. For the past month central Cairo has been packed with demonstrators who are angry about what they see as the sluggish pace of reform and failure to pursue former regime officials suspected of breaking the law. When a previous trial for the former Interior Minister Habib al-Adly was postponed in June, his police van came under attack from protesters hurling rocks as it ferried him away from the courthouse. The scenes that would greet any delay in prosecuting Mubarak would likely be a great deal uglier. April 6, along with many of Egypt’s other main political organizations, has said they will return to the streets en masse if the Mubarak trial does not go ahead. It has led some to speculate whether the sickly general can be guaranteed a fair trial, given the level of public anger which would result from an acquittal in even the most transparent of proceedings. Yet there is no doubting the political impact the case is likely to have on Egypt and around the region. 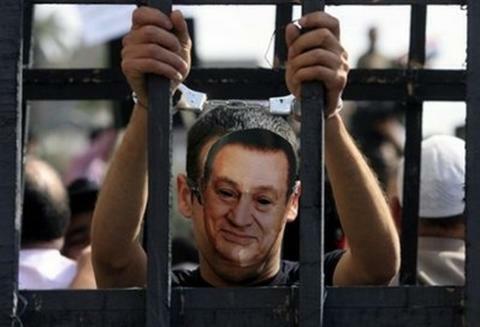 According to Ramy al-Swissy, the image of Mubarak standing in his courtroom cage will mean “justice will be clear” to everyone around the country, satisfying protesters who are still uneasy about the motives of the ruling military council. But its ripples will be felt further afield too. One Syrian activist told The Daily Beast why he would be following events in Egypt. “People who have been suffering for so many years will have some revenge,” he explained. If Syrian dictator Bashar al-Assad tunes in to watch this week’s trial in Cairo, he is unlikely to be the only Arab autocrat glued to his TV set. The question all of them will be asking is: who’s next?